Wishing for a Miracle4Mazie | Updates on Mazie Dylan. Thank you for your prayers and support! The girls are looking great and SO healthy!! 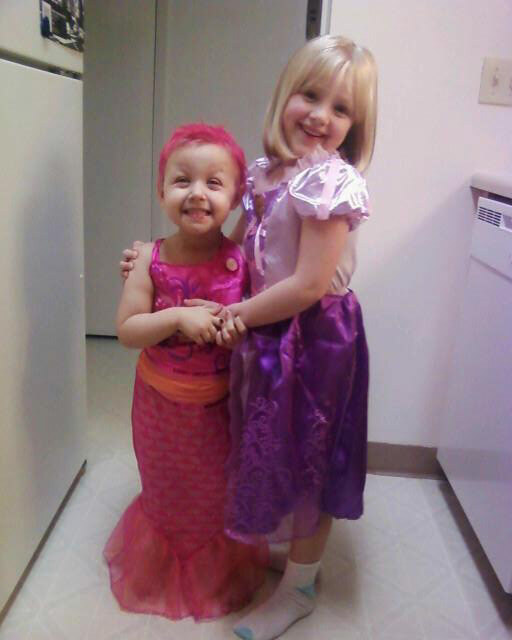 Alice is Rapunzel and Mazie is Merlia (barbie-mermaid-princess) LOVE her hair!! Mazie’s liver function is still excellent. The biggest challenge is the anti-rejection drugs she has to take for her new liver lowers her immune system but her parents are very diligent about keeping her well. Well, our little girl has been having a rough month but things are looking up. 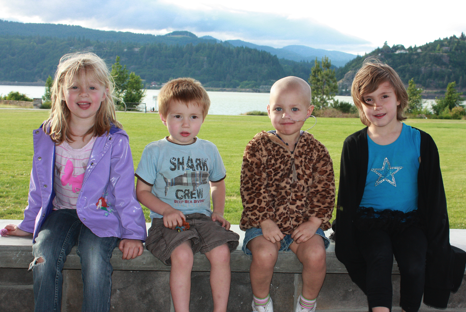 They returned to Oregon from California but they have only spent a few days at home, the rest have been at the children’s hospital through Mazie’s last round of chemo. The immune suppressant drugs she’s taking because of her liver transplant, along with steroids and then chemo just wiped her out and she got a stomach virus and a few other things, that well… not sure if that would be TMI here. Let’s just say she’s had a rough month but things started looking up yesterday. Mazie’s mommy, Andrea, said that she has smiled (first time in about a week) and was playing a little, so that’s a wonderful sign. I got to talk to her last week and I swear I could feel my heart break when I heard her voice, she sounded so fragile. Mazie’s 3rd birthday is coming up in June which is the time we found out last year that she had cancer, so we’re really looking forward to celebrating it with her. Papa Pudge and I went shopping for summer clothes for her this last weekend and it was nice to be doing something normal & everyday for her. Can’t wait to see Mazie in her new summer outfits but more important — too see her bright little face and knowing she’s going to be here for us to love for so many years to come. Also, I was talking to my Mom today and she had found out that her friend’s granddaughter in New Mexico, who is 2 also, has been diagnosed with cancer. Our hearts go out to their family. Her name is Avery, please include her in your prayers. More great news today! Mazie and her parents get to go back home to Oregon next week! Mazie’s dr.s and oncologist have agreed there is no reason to keep her at Stanford any longer and she can return to Oregon to finish her last round of chemo beginning around April 11th. They were going to finish up with 2 rounds but now they are just doing one. Mazie is still using a feeding tube which they will keep in through her last round. Not so much an update, but something really cute and pretty funny. Mazie has a very long (but good looking) scar from side to side across her lower abdomen from the liver transplant. The dr.s have been calling it her “Shark bite” which of course, she loves because she is so into anything that has to do with animals. too cute! She’s now on a immune suppressant drug that she is processing very well and they are working to get her levels steady. Whether or not they can return to Oregon for her final two rounds of chemo will depend on her liver function and levels. She will be on steroids for a little while longer. They’ve been told if anything were to go terribly wrong, it would likely be within the first two weeks of the transplant so she will stay on the steroids through that time because is suppresses the immune system also.